What's the Deal about QE3? There is much talk that the Federal Reserve (hereafter "the Fed") may soon implement another major round of stimulus, most commonly referred to as QE3. To understand its potential effects, a little background is needed on what "QE" is and its potential effects. QE3 refers to a potential third round of quantitative easing measures to be implemented by the U.S. central bank. With the Fed sensing that the global growth slowdown threatens to halt the fragile recovery of the American economy, Fed policy makers are again considering buying long-term assets from banks in an attempt to lower long-term interest rates, thereby increasing excess reserves in banks, which in turn should encourage confidence through increased lending. Ultimately, increased lending should spur economic growth. Central banks typically turn to extraordinary QE measures when the economy is deteriorating and short-term interest rates are about as low as they can go â€“ currently at the zero to 0.25% range in the U.S. The last round of QE stimulus was announced in October of 2010 and involved massive purchases of long-term Treasury securities, worth $600B in total. QE2 was followed by a lesser-sized stimulus measure called "Operation Twist," in which the Fed - without injecting new money into the economy - swapped its short-term balance sheet assets in favor of buying longer-term Treasuries. As denoted in our 2012 Mid-Year Market Outlook, we said the Fed was unlikely to launch QE3 measures unless the economy notably deteriorates. Recent evidence, including readings on labor, manufacturing and consumer sentiment, all suggest further deterioration has taken place. Furthermore, commerce officials revised their advance 1Q U.S. real GDP growth rate from 2.2% to 2%, while the government's estimate for 2Q growth weakened to 1.5%. And while more jobs were created last month, the unemployment rate rose to 8.3% from 8.2%, marking 42 consecutive months that this reading has been above 8%. With Federal Reserve Chairman Ben Bernanke acknowledging the persistent anemic state of employment, it appears more a matter of when, and not if, the central bank will intervene to keep the growth engines firing. As the following chart illustrates, past QE Federal Reserve interventions in 2008 and 2010 were welcomed by the equity markets on expectations for jump-starting the economy. 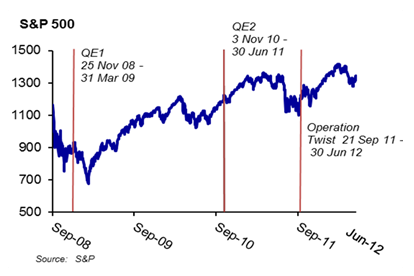 The S&P 500 rose 34% during the life of the first QE, 24% during QE2 and 15% during Operation Twist. Yet importantly, during the periods immediately following each stimulus conclusion, stocks pared their gains, falling 15% and nearly 9% respectively after the first two QE's. The data serves both as a warning should the now widely-expected QE3 action not occur, as well as an illustration of the likely benefits for staying invested prior to QE action. It also reiterates that in the absence of genuine legislatively-induced fiscal reform, market performance from quantitative easing can be rather short-lived. Key takeaways from the Fed's August 1st FOMC policy statement make it more likely that the central bank may implement strong QE measures at their next September 12-13 meeting, unless employment data meaningfully improves. Another factor leading to this view is that the September FOMC meeting follows the Kansas City Fed's annual global central banker Jackson Hole Economic Policy Symposium on August 31st through September 1st. The event has been used in the past to discuss potential monetary policy moves. As several market strategists observe, the Fed's mandate for full-employment suggests that the FOMC's expected QE3 action may involve the Fed making structured purchases of mortgage-backed securities (MBS) as opposed to Treasuries, thereby encouraging further recovery of the housing market. Regardless of form, the outlook argues for continued investor exposure to equities, with a preference for quality dividend-paying stocks. An exposure to commodities also makes sense, given their attractive valuations stemming from a potentially QE3 weakened US dollar. Additionally, higher-yielding corporate bonds are also particularly attractive. As always, we advocate investors keep their portfolios well diversified.